LONDON (Reuters) - Iraqi security forces and government affiliated militias appear to have unlawfully executed at least 255 prisoners over the past month in apparent revenge for killings by Islamic State fighters, according to a rights group on Saturday. Human Rights Watch (HRW) said the killings had taken place in six Iraqi towns and villages since June 9 and at least eight of the dead were boys under 18. In all but one case, the killings took place while the Iraqi forces were fleeing from Islamic State militants and other armed groups, it said on its website. The vast majority of security forces and militias are Shi'ite, while the murdered prisoners were Sunni, it added. "The mass extrajudicial killings may be evidence of war crimes or crimes against humanity, and appear to be revenge killings for atrocities by (Islamic State)," HRW said. Islamic State, an offshoot of al Qaeda, until recently called itself the Islamic State in Iraq and the Levant (ISIL). It is spearheading a patchwork of insurgents who hold territory grabbed in a blitzkrieg across the north and west of Iraq and have threatened to move on Baghdad. The militants have made no attempt to hide mass executions of their prisoners. Days after they began sweeping through northern cities last month, they released videos showing their masked fighters machine-gunning captive government soldiers lying in shallow graves. HRW said it had statements from witnesses, security forces and government officials indicating Iraqi soldiers or police, pro-government Shi'ite militias, or combinations of the three had extrajudicially executed prisoners, in nearly all cases by shooting them. It said it had documented five massacres of Sunni prisoners between June 9 and 21 – in Mosul and Tal Afar in northern Nineveh province, in Baaquba and Jumarkhe in eastern Diyala province, and in Rawa in western Anbar province. 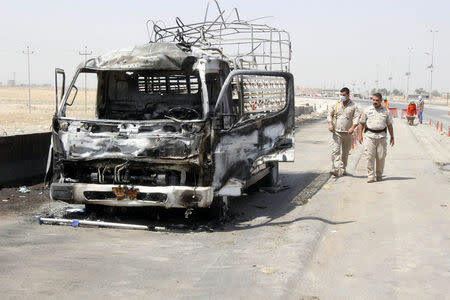 It said residents and activists those areas believed Iraqi security forces and militias killed Sunni prisoners released by Islamic State, to stop them joining the rebellion and in revenge for the killings of government troops. Joe Stork, HRW deputy Middle East director said gunning down prisoners was "an outrageous violation of international law". "While the world rightly denounces the atrocious acts of (Islamic State), it should not turn a blind eye to sectarian killing sprees by government and pro-government forces," he said.